Congratulations your decision to become a new homeowner in the Caribbean. We do not want to cause you unnecessary distress, but we are appalled at the substandard structural quality of houses built in the Caribbean over the past 2 decades. Evidence to support our concerns is provided below. To arrest this worsening trend, we strongly recommend that you ensure that your contractor has one certified construction supervisor or foreman on your site. Please find following our evaluation of three critical Caribbean building practises that are expected to result in significant losses in the event of a major earthquake or hurricane. Tragically, these critical defects could have been avoided at no additional cost to homeowner or the building contractor. 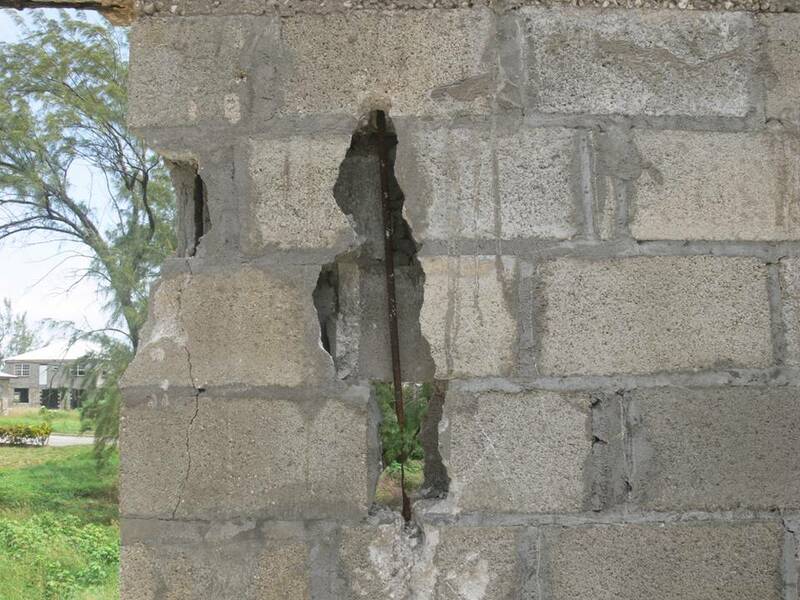 One of the principal reasons why buildings fail structurally is because the building’s elements (beams, columns, walls, slabs and foundations) are not properly connected to each other. For reinforced concrete framed buildings with concrete block walls, the building elements are normally connected to each-other with bent steel reinforcement. The reinforcing bars are bent to connect foundations to walls, columns to beams, and beams to slabs. The minimum safe radius that most steel reinforcement used in houses should be bent around is 3 times the diameter of the bar for British Standard (BS) steel and American standard (ACI) steel. British and American standard steel are commonly used in the Caribbean. In Figure 1.2, the bar needs to follow the red arc for British and American standard steel, in order to prevent damage to the bar. 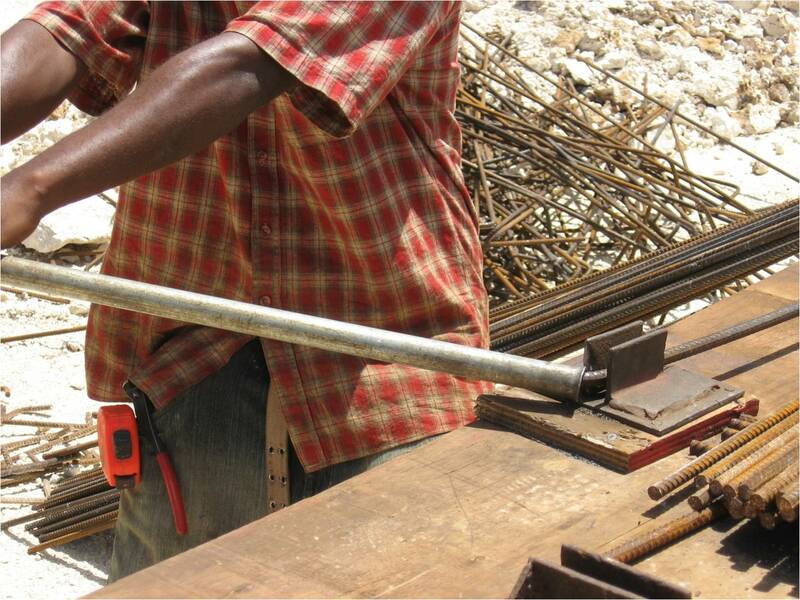 Figure 1.1 – Typical method of bending reinforcing bars on construction sites. Figure 1.2 – British (BS) and American (ACI) standard safe steel radii. 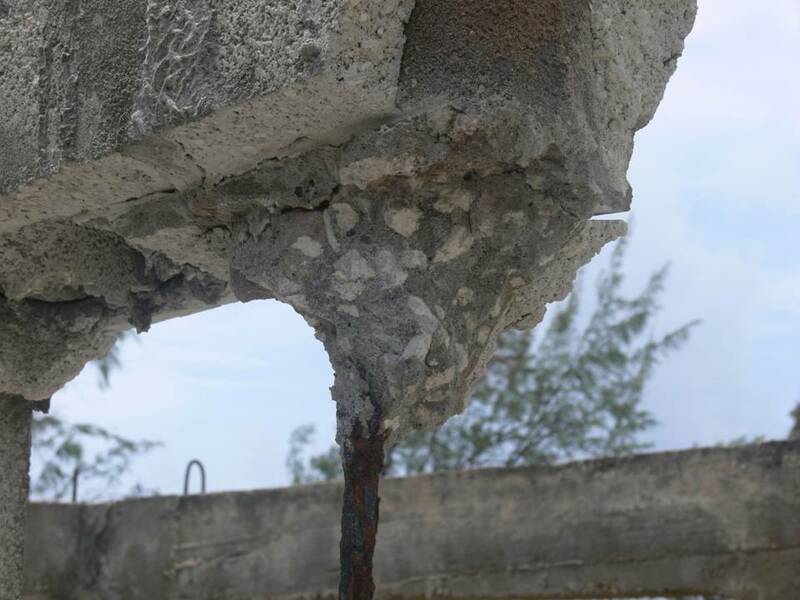 During a major hurricane or earthquake, buildings relying on connections consisting of bars that were bent to the point of failure around an unsafe radius are expected to collapse. In Barbados, such connections are typical, but could have been avoided at no additional cost to either homeowner or builder. Adequate shear walls prevent a building from collapsing during a major earthquake or hurricane. There are other methods of providing stability to buildings, but for houses, shear walls are the most economical option. A shear wall contains no window or door openings from foundation to the roof. 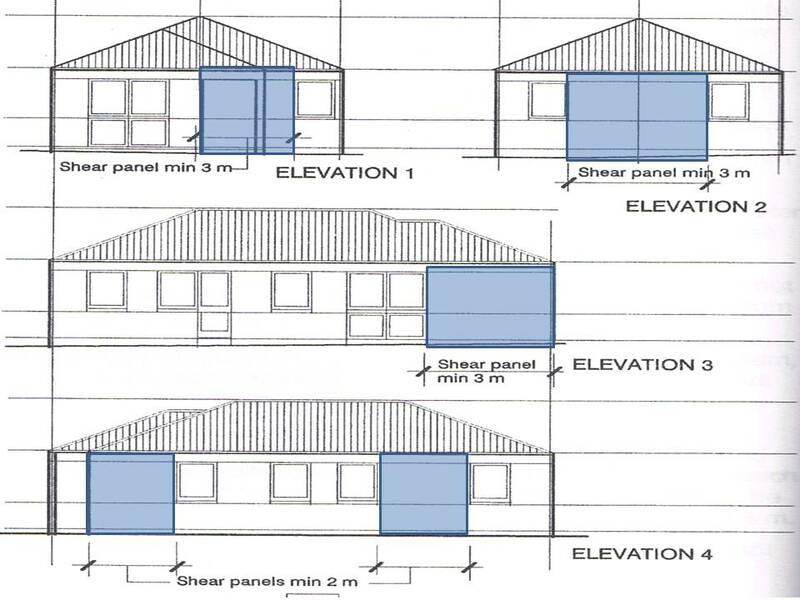 The Barbados Building Code specifies the minimum width of shear wall panel for a house to be 3 metres (m) in each elevation. If a 3 m wide wall interferes with the architectural design, then two 2 m wide shear wall panels in each elevation are permitted. 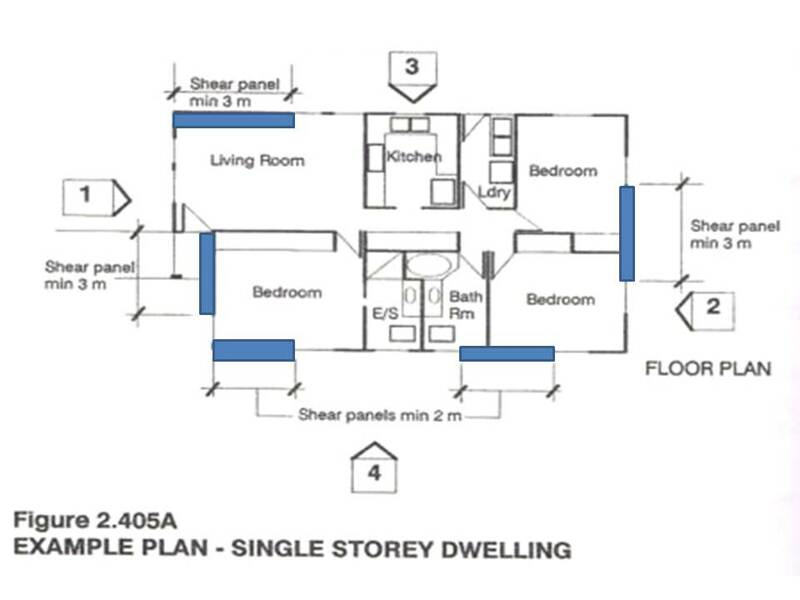 Figure 2.1 shows a plan and elevations of shear walls extracted from the Barbados National Building Code, Section 2.405.8. During a major hurricane or earthquake, buildings without shear walls, and without any other means of lateral stability, are expected to collapse. In the Caribbean, it is rare to find a house built within the past 2 decades with the critical shear walls. Shear walls could have been included at no additional cost to either the homeowner or builder. Unreinforced concrete-block masonry walls are expected to collapse during a major earthquake or hurricane. 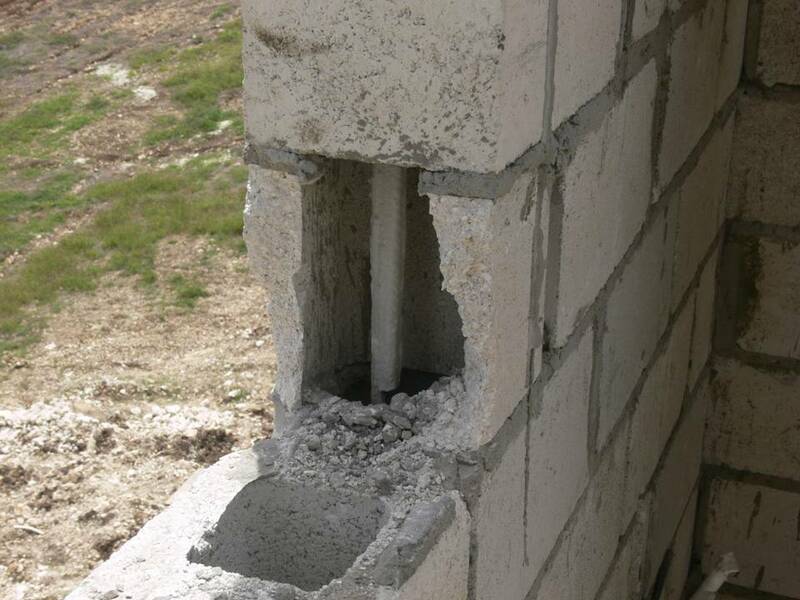 A wall is reinforced by placing steel rods into the concrete block’s cores, and filling them with grout. Grout should be sufficiently fluid to flow through the blocks’ cores and surround the reinforcing bars to protect them from corroding. The Barbados National Building Code and OECS Building Codes specify that a wall should be grouted every 3 block courses. 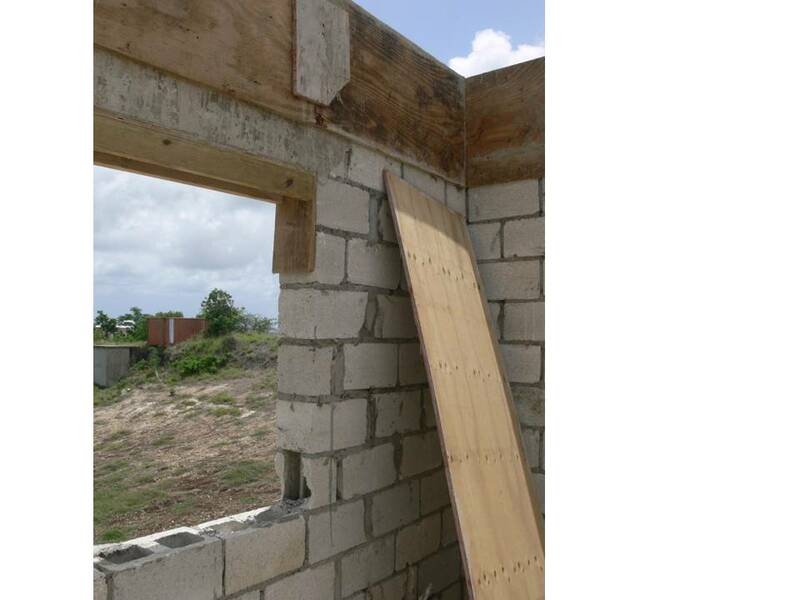 In the Caribbean, builders typically build the walls to the height of the beams, and then pour concrete in the beams and wall cores at the same time (see Figure 3.1). However, instead of using the more fluid grout, builders typically use the stiffer concrete that they use to pour the beams. Concrete used for beams does not properly flow through the block’s cores (see Figure 3.2). Instead, it typically gets clogged in the higher blocks (see Figure 3.3), which results in unprotected reinforcement in the lower block cores (see Figures 3.4 & 3.5), and an effectively unreinforced wall. . 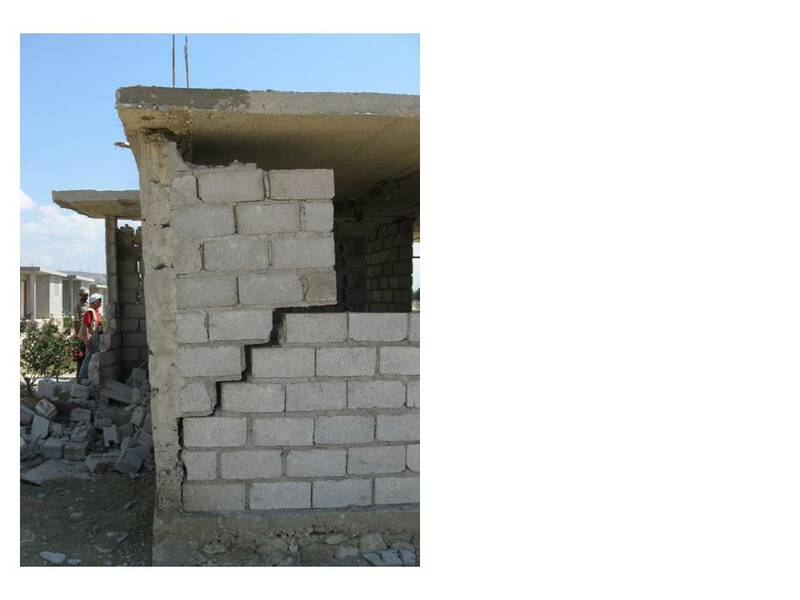 In Haiti, many of the walls that collapsed were unreinforced (see Figure 3.6). Figure 3.1 – The concrete used to pour the beam does not flow through all block cores. Figure 3.3 – Stiffer beam concrete plugged the upper block cores. Figure 3.4 – Ungrouted and corroding wall reinforcement in the lower cores. 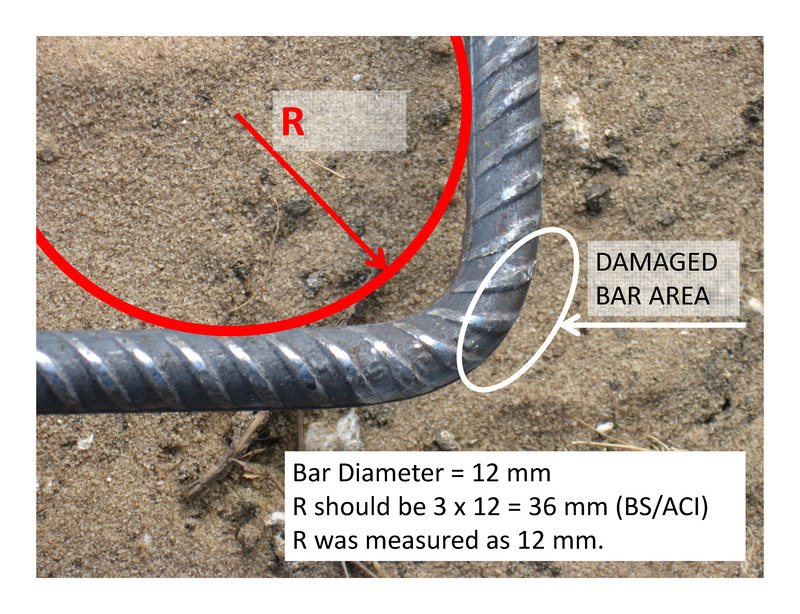 Figure 3.5 – Completely corroded bar. 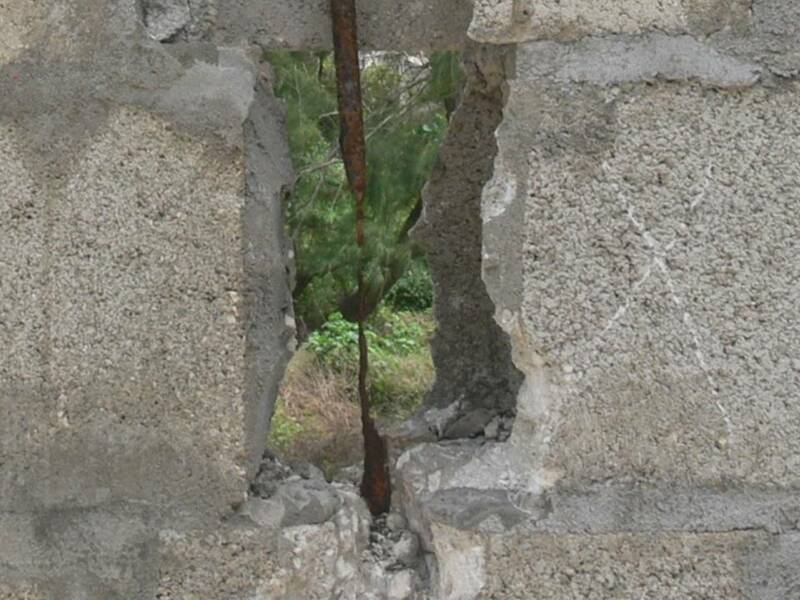 Figure 3.6 – Unreinforced window opening in Haiti – damaged by the 2010 earthquake. These are only 3 of scores of common substandard construction practises which I have observed in buildings constructed over the past 2 decades and which are expected to result in significant losses. To improve the quality of construction in the Caribbean, Walbrent College certifies construction supervisors through a 10-evening training course. Over 200 persons have been trained to-date, and it has been proven to be the most effective, efficient, and economical way of improving the strength and durability of houses. Each trained supervisor impacts the work of at least 7 trades, including: mason, carpenter, steel fixer, plumber, electrician, labourer, and designer. The list of supervisors certified by the College is provided on Walbrent.com. 1. Ask your builder for the name of the person on-site who is directing the construction activities on your house (normally the supervisor, foreman, or senior artisan). 2. Check the Trained Persons section of Walbrent.com and see if he or she is among the more than 200 already trained. 3. If he/she is, then congratulations, you will likely receive a house that will be safe during natural hazards, and one that will attract relatively few maintenance issues. 4. If he/she is not, then insist that they attend the 10 day certification course offered in the evenings (6:00 pm to 8:00 pm).